Many of you dream of turning your passion for barbecue into a business. Mark Van Blaricum from Kansas City did it. 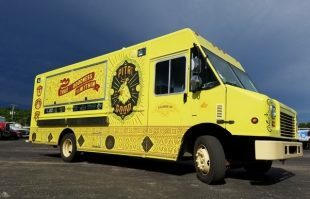 His Pita for Good food truck has become a mecca for KC grilled food lovers, and I’m personally gratified to have played my small part. Do you have a foodie success story? Share it on the Barbecue Board. It happened fast. I got Steven’s Planet Barbecue as a gift; found a lamb purveyor at my local farmer’s market; and tried the Moroccan and Turkish lamb recipes out on my family again and again until they came up with an idea. One year and 700 lbs. 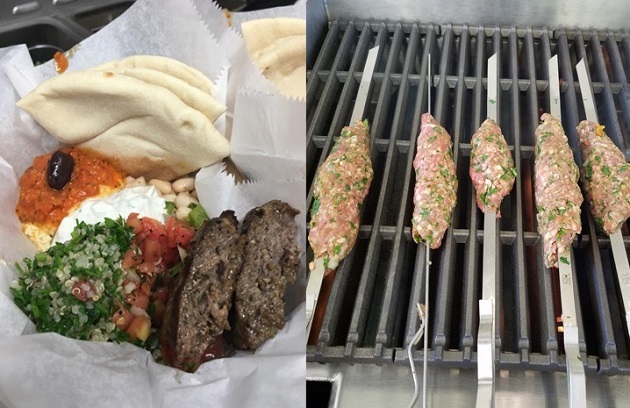 of ground lamb later, I had wrapped up my first season as owner and operator of Pita for Good, a Mediterranean food truck in Kansas City. Kansas City loves meat, to put it mildly, but my suspicion was that our chicken option would be the best seller with the lamb as a distant second. I was amazed when we sold out of lamb at our very first outing, and even more amazed when that 50/40/10 (lamb/chicken/vegetarian) breakdown held up outing after outing, month in and month out. My theory is that anyone adventurous enough to walk up to a bright yellow Mediterranean food truck is excited about trying something new, and lamb is still something new… and absolutely delicious. What we do is quite simple. I’ve cherry picked elements from several Planet Barbecue recipes to come up with my own variation. I season the ground lamb and form into patties (4-5 per lb.) and grill them onboard the truck over medium-high heat. I had tinkered around with skewers to do kofta style, but the kebabs would stick to the grill grates just enough to pull the meat right off the skewer. And when we need to crank out 20 orders at a time, patties and a spatula work just fine. We serve our lamb in warm pita bread with hummus, harissa hot sauce, tzatziki and some tomato relish. I get asked about the name, Pita for Good, quite a lot. I guess in some ways it is open to interpretation. We serve good food made straight from scratch; healthy food (though I would never say that out loud). We emit good smells; we exude a good vibe. We love our customers; we love our food truck community. We love serving people who may never have tried this kind of food; we even serve people who miss this kind of food from their native country. We love donating food to great causes about town. One customer last summer said “I just came from the Pita for Evil truck; they say hi”, so we have fun with it, too. Get the recipe for Pita for Good Grilled Lamburgers. Get the recipe for Pita for Good Harissa. All photos by Mark Van Blaricum.